The first suggestion we make is to read what we said last year about the month of Cheshvan. What will be said this year will build on what we said last year. Below is the link to last year's Blog about Cheshvan. Please press your back button to return to this location after you read last year's Blog. New Sections on the Yeshshem Website in Honor of the New Year 5779 - "Striving for Wisdom"
. It is highly recommended to read this each month of the year as there will be additional information added each new Hebrew Month starting with the 8th month of the year which is Cheshvan. In its Aramaic meaning Cheshvan represents the concept of reckoning / figuring. 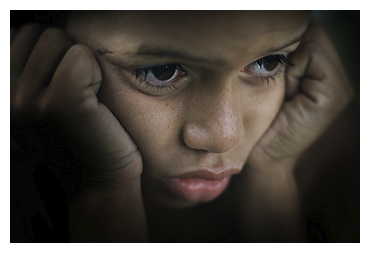 In modern Hebrew Cheshvan has the meaning of feelings including worry and fear. This is the basic motivation of people born during the month of Cheshvan and this same energy will impact all of us during the month of Cheshvan. The month of Cheshvan is the only month without a Holiday, yet we will learn that the month is intensely energetic since the Flood started on the 17th day of the month and the Torah tells us about the energy of Chanukah in a coded way when describing the story of the Ark and Noach being the father of all mankind - even more so than Adam. Attribute: Smell ריח Rayach: The word Rayach meaning smell is the least used and least understood sense. The word Rayach is cognate to our middle level soul called Spirit or Ruach רוח. It is said that the Mashiach will utilize the sense of smell to know the shoresh of each person's soul. During this month we need to take the time to "smell the roses". We need to contemplate what and how our next year is going to develop. We need to use our Rayach to nurture our Ruach. Contemplate this well. 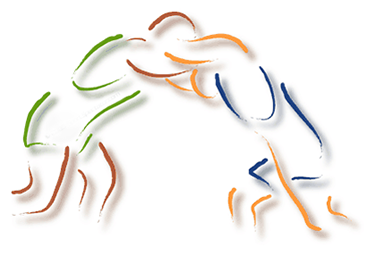 Ancient Tribal Connection: Naftali נפתלי The meaning of Naftali is wrestling / struggling. This is the essence of being an Israeli - Wrestling with the Creator. Naftali is named by our Mother Rachel. This name is unique in that most men think that Rachel was struggling with her sister Leah regarding children. Actually the issue was with HaShem who is the giver of children. The Torah says Jacob loved Rachel yet it never says that Rachel loved Jacob. Rachel loved children. Both she and Leah felt alive when they bore children while Jacob needs his love of Rachel to feel alive. It is this love of Rachel that is the cause of her death as well. This is the same idea we will discuss when we discuss the astrological sign of Akrav or Scorpio who is the only animal that will kill its children when it goes into crises as it is capable to do due to its fears. Modern Tribal Connection: Gad גד The Name Gad has the meaning of "fortune" as in good fortune. See below for more information about the Tribe of Gad. 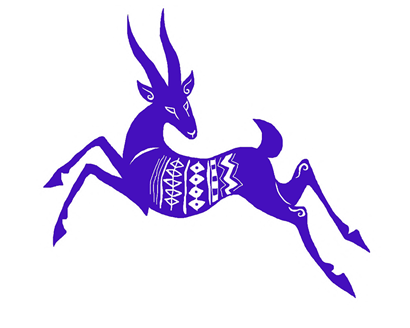 Tribal Totem: Gazelle Ahyalah אילה The Gazelle has a strong connection to spirituality as well as being extremely agile. Because the Gazelle moves quickly and in balance, the Land of Israel was called the Eretz Ahyalah in ancient days. This moving quickly and in balance is a way of describing a strong spiritual connection so Eretz Ahyalah is another way of saying Holy Land. Tribal Stone: Agate שבו Shavu. The Agate stone helps one walk in balance. Just like the Gazelle who walks in balance over uneven mountainous territory, the Agate stone helps people maintain their balance through many difficult life situations. The Hebrew word Shavu can also be translated as "His Seat". This implies that HaShem carries us through the difficult times in life like the month of Cheshvan which energy can be flood like and overwhelming. Tribal Herb: Saffron כרכום KarKom . 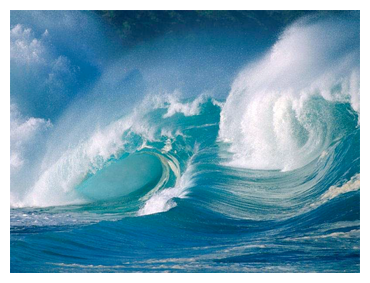 Karkom is believed to have the energy of unification of opposites. This is the role that it filled in the Ketoret - Incense by the Saffron. In the Incense the Saffron brings components together that will not mix together without the Saffron. House: Death בית המות Bait HaMavet. The meaning of the House is not actual death. The meaning is like the gazelle when it leaps across the abyss from one known place to a new place that it has not been there before. This leap breaks limitations and breaks free to freedom. This is the meaning of the House of Death. Death represents known limitations that need to be broken open so that freedom can be seen. 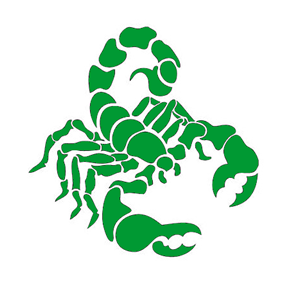 Zodiac Sign: Akrav עקרב Scorpion . See below for information about the Zodiac sign of Akrav. One hint regarding the energy of the month comes through the letters of the Hebrew word Akrav. The middle two letters spell the word Kar which means cold. This coldness separates the Ayin from the Bet. Ayin Bet has a gematria of 72 which connects to wisdom. There is much potential wisdom or learning in the month of Cheshvan if someone will open their eyes and see the limitations around them which we call our house. Tribal Flag: Light Red with an image of a Gazelle אדום קלוש Ehdom Kalosh. The light red indicates soft judgment but still judgment. See above for the Gazelle meaning. Tribal Direction: North צפון Tzafon This word for north has the idea of hidden, concealed, and a mystery. This is the idea of jumping over one's rocks or problems to avoid going out of balance. The month of Cheshvan is the eighth month of the Hebrew year. As the number eight relates to Binah in the frame of the Sephirot. Both Binah and Malchut use the metaphor of the Letter Hey in the Tetragrammaton. They both represent vessel. Binah represents vessel in the spiritual frame. It is a level of consciousness that is outside of the physical world. Of course, Cheshvan is in the physical world as it is a month that we use in the physical world. Yet it has a connection to being too much energy for the physical world. This is because during Tishrai all of the Holidays revealed a tremendous amount of Light which is expected to become manifest during the month of Cheshvan. If one looks at the spelling of the Name of the Month Cheshvan one realizes that the final letter Nun represents that this word is a noun. The third letter Vav when looked at as the end of the word means "His." This leaves the first two letters hinting at the shoresh. This shoresh is Chet Shin Shin. The meaning of Chet Shin Shin connects to anxiety, fear, and worry. The meaning of the name of the month Cheshvan is strongly connected with worry and fear and anxiety. The month of Cheshvan has a word added to it. Whenever words are added there must be a reason and that reason can not be just a physical reason. The typical answer to why the word Mar or bitter was added to Cheshvan by "the people" is that there is no Holiday in the month of Cheshvan. Of course, this is a physical reason and it is not complete. This word Mar comes from the shoresh of Cheshvan. The shoresh connecting to the energy of worry and anxiety. A lifetime of worry and anxiety leads to a bitter life. When one overcomes this fear and anxiety one can reverse the letters of Mar (bitter) and transform Mar to Ram which means elevated. That is the potential of Cheshvan. It can be bitter or elevated depending on how you handle the energy. The months of the Hebrew year are connected to the Tetragrammaton. The Kabbalists teach that Tishrai along with Cheshvan and Kislev are connected to the Vav. In Kabbalah the Vav represents Zeir Anpin which is also called "Son." The "Son" is both the brother and the husband of the lower Hey. Zeir Anpin consists of what is called six ends. The Kabbalists teach that these attributes - six ends are the emotive passions or emotions. The emotion and passion of the month of Cheshvan is fear and worry. The letters Dalet and Nun spell the word din which means judgment. A person born in the month of Cheshvan and connected to the Scorpio is constantly in fear and worry at the level of their soul. This is their Tikune. Learning how not to be afraid. Not to act out based on fear. Please realize that this statement belongs to the Scorpio where ever it is found in an astrological chart not just the sun sign. Now let's look at the permutation of the Tetragrammaton for the month of Tishrai and what we can learn. When we look at the permutation for Cheshvan, we see the Yood and Upper Hey in their proper position. This indicates the flow from the upper worlds is "normal." The third position has the Hey in the position of the Vav. This indicates an expansion of the vessel and the flow. The Vav in the fourth position indicates an inability to manifest energy and also a pronounced expansion of emotions. We see this in the Astrological impact of the month of Scorpio. They are ruled by their emotions primarily fear. The letter Dalet created the planet Mars. The word Dalet means "door" or "doorway." The word Dal spelled Dalet Lamed means lowly or poor or pauper. The planet Mars is considered the planet of war or blood. With respect to the month of Aries this plays as breaking limitations and creating freedom. In the case of Cheshvan and Scorpio, Mars demonstrates a reactive behavior to strike first as a means of covering their fear and lack of courage. Again please remember that this applies to the Scorpio in a chart and that each person is composed of 12 different aspects - some manifesting courage and others indicating a lack of courage. Not all Scorpio's lack courage. Mars also lends strength to the Month of Cheshvan. This power goes into high gear whenever a Scorpio senses danger. The letter Nun created the Astrological sign of Scorpio and also our sense of smell. The Midrash says that Adam and Eve used four senses when performing the Mistake we call the sin. They did not use the sense of smell and therefore, this sense does not to have the same level of correction as the other senses. The word Nun means fish as well as failure. 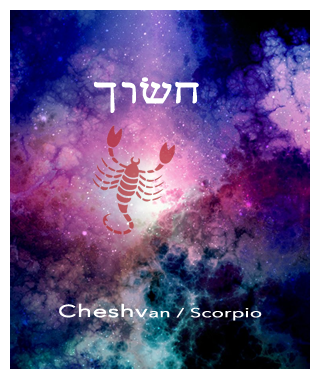 The true nature of the Scorpio is seen in the Hebrew spelling. It is spelled Ayin, Koof, Reish, Bet. The middle 2 letters Koof and Reish spell the word Kar which means "cold." The other two letters show the Scorpio's connection to the 72 Names of God. As we will see below, the Tikune of the Scorpio is to transform the Kar into Rack (Reish Koof) - Coldness into the connecting word "just or only or except." After this transformation the Scorpio has one of the strongest connections to the 72 Names possible. The two letters Dalet and Nun spell the word Din which means judgment. Judgment can be very cold. When we transform this word into Nun Dalet or Nod which means wander or move we transform Judgment into justice. Justice is where the effect (punishment) fits the action (crime). The Hebrew word Tzedek which means justice is also a Name for the Sefirah of Yesod. This is usually the area that the Scorpio manifests their power in the sexual arena. There are no specific Holidays in Cheshvan. There are some very powerful days in the month. One is the 11th of Cheshvan which connects to the Hilula of Rachel Imeinu. It is also the birthday of Benjamin HaTzadik. Also, the longest living man Methusalach passed on this day. It is said in the Midrash that the Flood did not start until the "Sitting of Shiva" took place for this Tzadik. The 17th of Cheshvan is the day in History that the flood started. Remember the teaching from Kabbalah. The energy of the day is the cause for things that happen on that day. The 17th day is a good day in every month. This is from the gematria of the word good which is Tov in Hebrew. There are some Sages that teach that the Mashiach will manifest during the month of Cheshvan. The 25th of Cheshvan is the day in History when the flood finished. Please read above for information on what this energy is all about. Here is the link to the Tzadikim from Cheshvan. I suggest you spend some time during this month checking out the attributes of the name Gad and the Name of the Nasi who gave the dedication and his consciousness of why he gave what he gave. Remember not all of these attributes are positive and with the tool of Binding by Striking we can correct them and transform them into positive aspects. Here are strategies to adopt for this month of Cheshvan. 1. Limit your extreme emotions during Cheshvan. It is important to realize that the power and strength of Mars will tend to bring people to extreme ends of human emotional responses. With this realization make it a conscious decision to not be reactive and manifest these extremes. 2. Envy can be rampant during Cheshvan. Envy and Jealousy of the Scorpio are well known. One must guard against one's desires for what others possess during this month of Cheshvan. 3. Beware of the sting of the Scorpion. The Scorpio people strive for control. This is due to their extreme emotional fear and anxiety. When control is taken away from them they react with a powerful (sometimes self-destructive) action. This is referred to as the Scorpion sting. This is something that will impact each person during the month of Cheshvan not just Scorpio people. 5. Exercise Binding by Striking during Cheshvan. The astrological influence for Cheshvan will be strong emotional responses to situation. The only tool that assists us against these strong powerful reactions is Binding by Striking. If your lunar north node is in the Zodiac sign of Cheshvan, your Tikune is in Cheshvan. In your previous incarnation as a Taurus, you were firmly attached to a certain way of viewing the world. This view left you stubborn, slow, and unwilling to change. You were the consummate Hedonist. You were in love with beauty and nature, were extremely possessive, and pursued material rather than spiritual assets. Fearful of the loss of your own comfort you cut yourself off from meaningful experiences. Hemmed in by obstinacy you did not listen or learn from others. In this lifetime you have the tools to make meaningful change. This Tikune like most Tikunim is difficult. It may entail some material loss until one realizes the futility of materiality and makes a spiritual connection. As time goes on, you will become more independent in your actions. Your relationships will deepen as you develop more and greater empathy and remove the coldness (the middle letters from the Scorpio (Akrav). This can only occur when you start considering others and appreciating their connection to the Creator and not what material value they can have towards you. By letting go of your fear of material loss, you will increase your capacity to receive, both on spiritual and material levels. Cheshvan is a difficult month; remember Tammuz and the first half of Av? In Cheshvan our material desires come to the forefront of our minds. Strive to overcome these thoughts and desires as they are not ever true for US in Cheshvan. They are false desires. If we realize this and do not pursue them we develop spiritual strength and build our vessel to receive the miracles waiting for us next month in Kislev. I have a special relationship to the month of Cheshvan. This is because my last lifetime was spent learning the life lessons of the Scorpio. This lifetime to show me those aspects of myself that had not yet been completely learned the universe provided me with two parents who were Scorpio sun signs. They provided one sister also to show me this side of myself after my parents passed. I chose to marry a Scorpio wife and one of my daughters is a Scorpio. It is amazing how the universe works in providing us information about ourselves if we will just be honest with ourselves and open our eyes to see the truth. The Scorpio people have the greatest ability to become one with Creator because they have the farthest to go in letting go of the material. This tikune is achievable. Someday ask me my full story and i will help you understand what i just said. 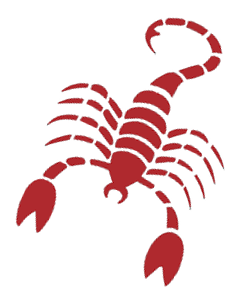 Scorpio people like the Scorpion animal have the ability to go into crises where they do not realize how self-destructive their behavior can become. In fact they will even eat their future by eating their children when they go into crises. This comes from their coldness and lack of empathy. When a Scorpio goes into crises IGNORE the crises and they will come out of it themselves. This is good advice to use during the month of Cheshvan. Ignore those who would lead you into crises. Use Binding by Striking to know who these "leaders" are. During Tishrai we do not say the Prayer of Tachanun. Here is an original essay that gives us information about this sometimes daily prayer. i have added some additional Kabbalistic information about this subject as well. As we went through the davenning (prayers) throughout the High Holidays, we realized how influenced we were by the letters and words that comprised the different piyutim (poems) and prayers. The use of the Alef-Beit as an acrostic for many of the piyutim created a rhythm and beauty that complemented the content of the poetry. Having this experience in our davenning has given us the idea to have as a theme for this year's Alef Bytes a discussion of prayers in our davenning relevant to the letter for each month during the year. We hope that our study will enhance our appreciation for the spiritual structure of the Alef-Bet and strengthen our connection to our davening whether we are novices or experienced participants in formal prayer. Hanging onto the spiritual high of Rosh Hashana, Yom Kippur, Sukkot, Shemini Atzeret, and Simchat Torah is almost impossible. How do we come down from the "high" of the High Holy days without losing who we thought we had become? How do we hold on and let go at the same time? What do we do with the dissipation of the intense spiritual energy from the entire month of Tishrei? How does the month of Cheshvan help us? From Yom Kippur to the 2nd of Cheshvan, it is traditional to not recite in the morning service the Tachanun prayer that follows the silent Amidah (Shemoneh Esrei). Tachanun is an intense prayer of supplication in which we let our face fall to our arm and plea for G-d's gracious compassion. During times of joy and celebration Tachanun is omitted, so it waits till after Rosh Chodesh (the New Moon) Cheshvan to be recited. Both of the words -- Cheshvan and Tachanun -- have the word Cheyn (Chet-Nun) in them. The first and last letters of Cheshvan (Chet-Shin-Vav-Nun) and the central letters of Tachanun (Tav-Chet-Nun-Vav- Nun) spell Cheyn. Cheyn is most often translated as graciousness and is usually paired with the word Rachum, meaning compassion. We find these two words together in the 13 Attributes of G-d, "...Rachum v'Chanun..." "Gracious and Compassionate..." Rachum, compassion, is most easily understood to mean empathetic caring or deep sympathy. But what does Cheyn, Graciousness, add to this? Cheyn implies showing this compassion to someone undeserving, perhaps someone who has "fallen." Being indulgent and finding favor with one who is undeserving of compassion is the hallmark of graciousness. Let us look at a deeper discussion of Cheyn. Cheyn is an acronym for Chochmah Nestar. This translates as Hidden Wisdom. Let us look at the other letters of the two words as well. Cheshvan has the letters Shin and Vav. When the Vav is spelled out completely the word becomes Shin Vav Vav which has the meaning of being equal or equivalent. The letters left over from Tachanun are Tav Vav Nun. This translates as the "sign of fifty" which relates to the Sefirah of Binah. What we learn from this permutation is the month of Cheshvan can connect to Binah when the consciousness is equivalent of the Hidden Wisdom within Binah. There is no more appropriate time for us to seek G-d's Cheyn, G-d's Grace, than after we have soared with all of our good intentions during the month of Tishrei and are in danger of crashing to the ground as we return to "ordinary" time. We need G-d to extend generous compassion to us, even if we are undeserving. This is the purpose of saying Tachanun during Cheshvan on days that do not have their own energy of joy. There is no holiday in the month of Cheshvan to lift us up (hence the appellation Mar Cheshvan or Bitter Cheshvan). It is only through the grace of G-d that we can hang on to what we achieved during the month of Tishrei. And it is only through G-d's cheyn, G-d's grace that we can come down from the lofty place of the Shemoneh Esrei where we are in intimate conversation with G-d to return to our daily lives. Interestingly, this prayer follows right after the Shemoneh Esrei, the "high" point of the weekday morning service. These two high points, the month of Tishrei and the Shemoneh Esrei, are both followed by a month/prayer that enables us to fall without being lost -- Cheshvan and Tachanun. Just as we literally put our heads down during Tachanun as we echo the words of King David, "...Let us fall into G-d's hand for His mercies are abundant..." we ask G-d to show us Cheyn, Graciousness, and rescue us no matter how far we may fall. Falling into G-d's hand is the path to our ultimate redemption. This is why some of the Kabbalists teach that Mashiach will manifest during Cheshvan.